We received this review today from a guest who recently stayed at the Queen Victoria Inn - we thought it rather articulate for a meatloaf kind of guy and hope that others might enjoy his venture into one-of-a-kind lodging and find the courage to try the untried. I'm the kind of guy who would rather eat meatloaf and mashed potatoes at home than beef wellington and fois gras at a fancy restaurant, the sort who prefers a night in the recliner watching TV to an evening of theater or ballet. I'm a basic guy who doesn't need anything fancy to be happy. I never imagined myself as someone who would enjoy the quaint, communal atmosphere of a B&B and the thought of sharing an old home with strangers didn't exactly thrill me... then I visited the Queen Victoria. To say they exceeded my expectations would be a gross understatement and as it turns out, even a basic guy like me enjoys being pampered every once in awhile. I was hesitant when we checked in and I walked through the building, but at the same time, I was impressed at how beautifully restored it was. Our room was on the third floor and I loved that I could see the ocean from my window. It was a pleasant surprise. The private bathroom was bigger than our bedroom at home. After checking in, my wife and I headed down to their afternoon tea time and I expected to be amongs a bunch of old people (my wife and I are in our 30s) sipping tea and eating crumpets.I didn't even know what crumpets were and I wasn't anxious to find out. We walked into the dining room and I was shocked to see the food setup with all the different choices from sweet to savory and relieved by the many different drinks besides tea (I had a Coke). I was equally surprised to see couples our age and one that was even younger, mixed in with all the other guests. That was the point when I began to realize my feelings about B&Bs were off-base. My wife and I ate so many tea time snacks that we weren't hungry for dinner and there was a lot of conversation with other couples. That was another surprise. I expected it to be awkward and quiet with people stumbling to find things to talk about. Instead, the conversation flowed freely and between the other visitors and the B&B owners who mingled with us, there was never a quiet moment. It felt like we were old friends, if that makes sense. There was a sort of congenial, quaint atmosphere that reminded me of past holiday celebrations with my family. Tea time the following day was equally as relaxing and though there was another buffet of food offered, it was completely different from the first day. The breakfasts were informal and featured two buffets filled with all kinds of great food from an assortment of homemade baked goods, high-end breads and imported English Muffins (with homemade strawberry jam) to gourmet souffles, stuffed french toast and breakfast meats to go with them. There were three different kinds of juice, an entire tray of different teas and great coffee, which made my morning. There was not one thing about my stay at the Queen Victoria that I did not enjoy and the little extras like the nightly turn-down service with chocolate coins on the pillows were greatly appreciated. Our bathroom had a two-person shower with water coming at me from all directions and it felt like showering in a waterfall. Like I said in the beginning, I never expected to be the sort to enjoy a B&B, but then I visited the Queen Victoria. I have since been persuaded to visit other inns with my wife and most were nice, but none compared to the Queen Victoria experience. Somehow, the people at the Queen Victoria make you feel like both a member of the family and a VIP guest at the same time. However they do it, I hope they never change a thing. Father's Day is June 16 and the whole family can come along for a Wolf Photo Safari and in addition, there's white water rafting and fly fishing at Madison Valley Inn in Montana. Inns around the country offer the nature rich experience of activities that appeal to our hunter-gatherer side but with the end of day comfort that allows for cushy beds, deluxe bathing and hearty cuisine. Suggested searches include Gold Country, California, Cape Cod, Texas, Juneau, Alaska, Sedona, Arizona and any alligator invested town or wood covered mountain you can think of. For most of the US population, there is a gentlemanly adventure within a three hour drive so skimp on restaurants and make it a goal to get out to taste and see our adventure-filled country. The pristine Montana valleys and mountains serve as the backdrop for this inn with its unique blend of English, Japanese, French, and Chinese antiques. Exposed wood beams give the reminder that this is a true mountain inn. Three guest rooms offer seasonal fresh flowers from the garden, thick towels in the private bathrooms, and views of the surrounding hills. From October until June, wolf safaris are offered so guests can see these majestic creatures in Yellowstone National Park. Coyotes, elk, mountain goats, bison, and mountain lions also roam the remote valley. Enjoy a candlelight dinner after a day of trekking through the woods or simply soak in the spa under the never-ending starry sky. Civilization is nine minutes away in the seven-block town of Ennis with shops and western bars. The innkeepers are happy to assist in planning your activity filled vacation with fly fishing on the Madison River, white water rafting, and a trip to the Lewis and Clark Caverns. 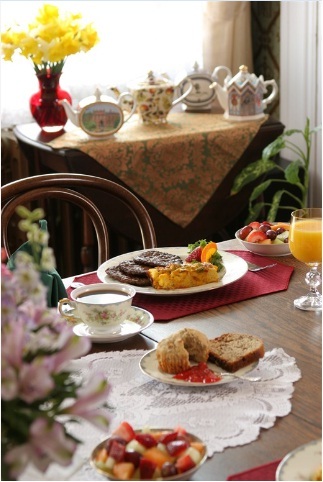 Berry Manor Inn is in Rockland, Maine and offers . - Overnight accommodations in our AAA Four Diamond rated guest rooms. Additional nights may be added. - Wine Tasting Notebook to taste like a pro. - Two tickets for "Nap-AH Wine Tour" which includes pick up and drop off, driver service in a mini-coach to 3 local wineries, storage for purchases and complimentary snacks and bottled water. Wineries include Sweetgrass Winery and Distillery, Savage Oakes Winery and Cellardoor Winery. - Voucher for lunch at Cellardoor Winery as part of the tour ($25 value). - Driving map to the other local wineries. - Maine Wine Guild map to all wineries in Maine. But we don't take the time to say thank you, thank you for everything you do and all the ways you love us! Across the country, mothers are being remembered on their special day. So what better way to say thank you then a special time away at a beautiful bed and breakfast? In the heart of Northern California, the St. Bernard Lodge in Mill Creek is located next to Mount Lassen Volcanic National Park. This charming lodge with turn-of-the-century décor overlooking a trout pond is remembering Mom throughout the month of May. Book two nights and receive a 20% discount off the second night. On Mother's Day, the entire family can enjoy a Champagne Brunch with mom. Make reservations early to secure your place. This brunch is served from 9 AM - 2 PM for $21.95 per adult, children 12 years old and under are $12.95. Children 3 and under are free. In Marion, Iowa, Victorian Lace Bed and Breakfast celebrates Mother's Day with fresh flowers and a bottle of wine. Mention iLoveInns.com and receive a 10% discount when you book your room. 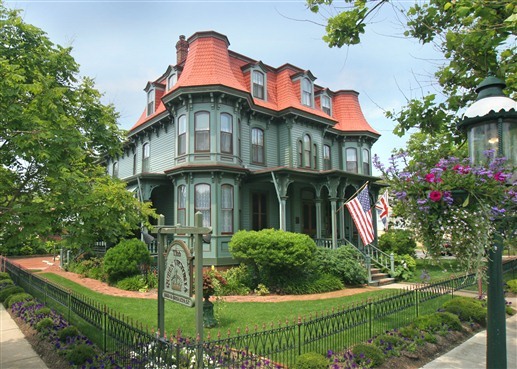 Sylvia's Irish Inn in Urbana, Illinois has "old world charm with modern conveniences." This Inn, within walking distance to the University, is offering a Mother's Day Medieval Dinner with music. In East Marion, New York, Aunt Dot's Victorian Bed and Breakfast Aunt Dot's was built in 1860 and reflects the charm and architecture of the period with all the modern amenities for guest comfort. Every mom gets a FREE plant on Mother's Day weekend when a guest mentions iLoveInns.com. The year is 1810 and The Inn at Duck Creeke at Wellfleet, Massachusetts, was a sea captain's homestead situated on five wooded acres overlooking Duck Pond, the salt marsh and tidal creek. The Inn has been welcoming guests for generations to enjoy the beautiful Cape Cod beaches, art galleries, and shops. 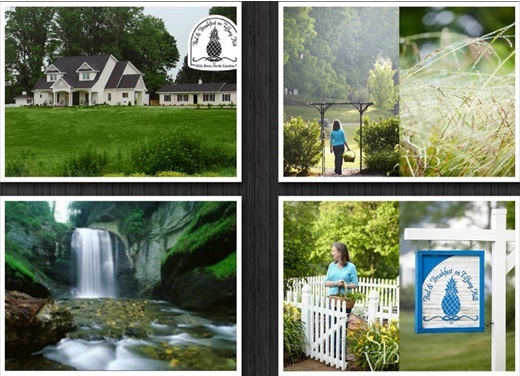 The Inn at Duck Creeke recommends using your Buy-One-Get-One Night free certificate available in the iLoveInns' book Bed and Breakfasts and Country Inns, which you can purchase on this website. Restrictions apply on Memorial Day weekend. Stay on Mother's Day and receive a bottle of Prosecco. There is more music and fun to be had at The Inn at Peralynna Manor in Columbia, Maryland. Within easy reach of Baltimore and Washington, D.C., this gorgeous, breath-taking mansion provides a relaxing and memorable stay in the lap of luxury. Amenities abound no matter where you decide to stay. Savor a fabulous dinner with dancing to live music on Friday and Saturday nights over Mother's Day weekend. Include "Pine 301" when making your reservation and receive roses for Mom in your room upon arrival. What better place to stay in May but at the Beacon House Inn in beautiful Carolina Beach, North Carolina, right on a pristine beach! This 1950s Boarding House has maintained much of this original charm with the comforts their guests have come to expect. Located in the heart of Carolina Beach, Beacon House Inn is central to the business district with great locally owned restaurants and a plethora of shops and services for guests to enjoy. For the perfect Mother's Day, treat Mom to two nights of rest and relaxation at the beach anytime during the month of May and receive fresh flowers, 1 one-hour massage and breakfast for two each morning. Packages begin at $350 plus tax. 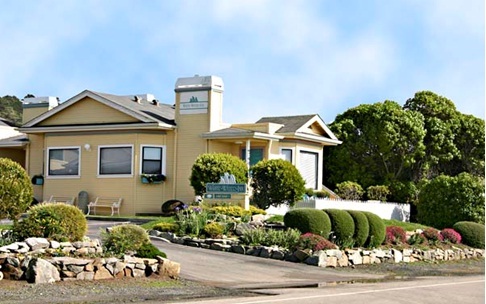 To find any bed and breakfast and to purchase a B&B Gift Certificate for Mom go to www.iloveinns.com or call the company at 949-499-8070. 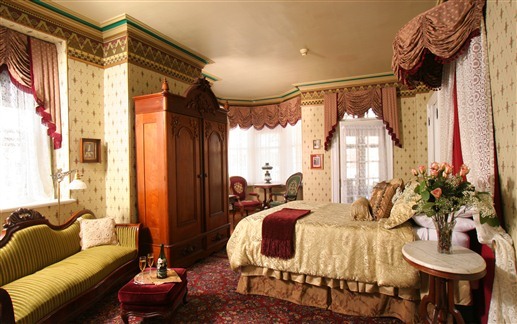 American Historic Inns has been recommended by USA Today, Woman's Day, the New York Times, Washington Post and many others. I've always loved this inn and the things people have told me about their experience here but this guest said it vibrantly. Today a newly wed couple wrote in to tell us about their wedding at Victorian Lace Bed & Breakfast in Marion, Iowa. "We went to Victorian Lace to get Married and spend the night in the honeymoon suite, WOW we had a great time Reverend James performed a very romantic service, it was light and had a little humor. we both cried just a little. The Honeymoon suite was more then we expected; Jacuzzi whirlpool, free beer, and the heated pool was great. This was a great wedding and the start of a wonderful Honeymoon. Rev. James goes the extra mile and includes in his $175 wedding a beautiful old-fashioned Iowa wedding license for couples as a special keepsake. He believes, "A wedding is a celebration, not a funeral, so I make it fun." The innkeeper has a romance of his own as he returned to Iowa from California a few years ago and married his kindergarden sweetheart, Renee. 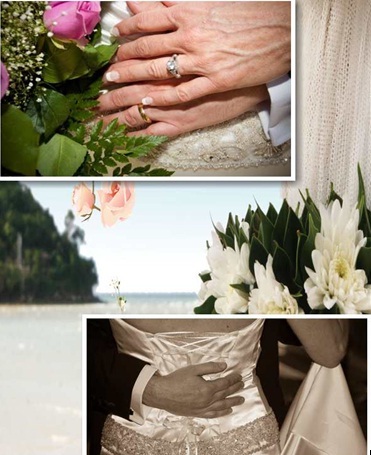 Innkeepers all over the United States offer economical wedding packages in their destination towns and bucolic villages and while most are not ministers, they know who to bring to the inn to perform a perfect wedding. 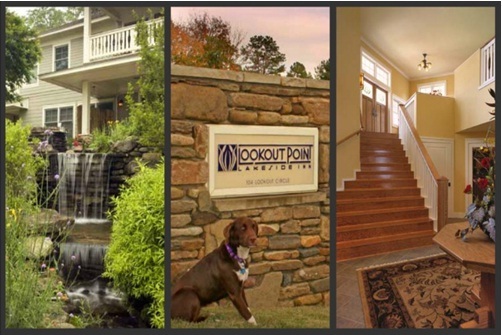 Here's an example of a special created by a Hot Springs, Arkansas bed and breakfast, Lakeside Point Inn. April 14-30: Taxes are filed-celebrate with a 3 night stay and receive a complimentary Inn the Mood Package including French sparkling wine, Lake Champlain chocolates, and a personal sized cheese/cracker/fruit basket (value $90). Please mention the April Specials when making your reservation. Not available with any other discounts/promotions. 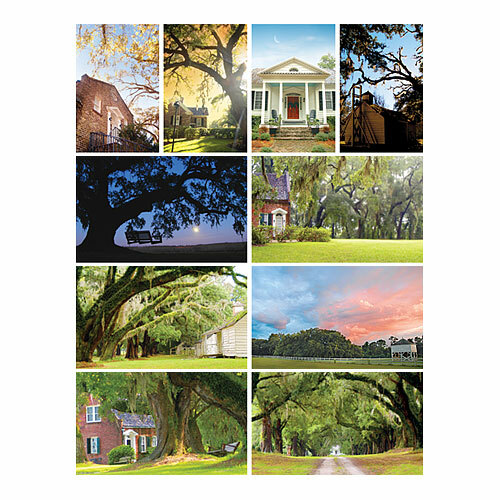 "I had been hinting for over a year to my Husband about bringing me to the B&B on Tiffany Hill! We took a road trip from Texas to come visit. We were not disappointed! I give it 5 stars!! The experience was better than I had imagined. Selena is a doll and so hospitable and so informative! We were so happy that she suggested places for us to go see. But beyond experiencing the beauty of part of NC, I would have been happy just staying at the B&B and taking in all the beauty there, inside and out. I love the decor and cleanliness of every room. And Selena has thought of everything from bird watching to reading to providing quite a few beverages to drink. She is so organized and thought of every little detail, you'll open a drawer and find what you are looking for. My husband brought me for my birthday which fell on Easter Sunday. Selena had a birthday card and cookies waiting in my room for me when we arrived the day before. Then the morning of, she brought out a piece of dessert with a lit candle and sung me "Happy Birthday". I just turned 47 and this was one of my best Birthdays ever! I definitely want to go back for my 50th but I don't think I can wait that long!! I want to say, "Thank you Selena! And God Bless You!! I know He already has and thank you for passing on the blessings!! I pray that He continues to bless you in everything that you do." - Penny G.
I invited my bffs on an girlfriend getaway to California's the mid coast for a 4 day getaway. We saw more wildlife in an seven-hour day than I saw on a seven-day cruise of Alaska. Starting out Monday morning, Alice, my walking friend (she walks 10 miles a day when on vacation) spotted sea otter and seals and a number of sea birds. After breakfast at the White Water Inn in Cambria, California (it was brought to the room), we hopped in the car which now sported windows cleaned by the inn staff (a surprising courtesy so you don't miss any of the Big Sur coastal views), We headed out to see the elephant seals just north of Moonstone Beach and the inn. 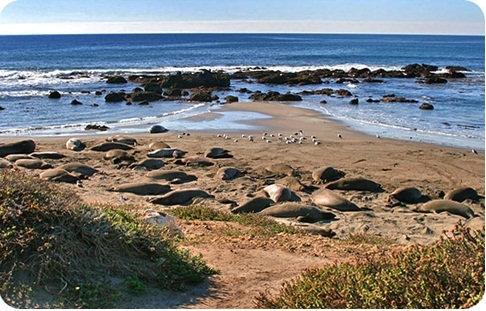 Hundreds of seals were nursing their hundreds of babies while simutaneously fending off male advances. The docent informed us that this was one of 4 spots in the world where we coulds see such a sight. When we returned to the inn, they were hand feeding the local bluejays and taught us as well. The birds landed in our outstretched hands and swooped away with their breakfast. Then, just as we were packing up, guests at the inn - a youngish retired couple - came by with guitar and the innkeeper orchestrated an impromptu concert right in front of the inn. Then onward up the coast to our next stay - the yurts at Treebones. Here's a way to jumpstart your cooking sensibilities and have an inspiring getaway all at the same time while staying in a Georgian Revival mansion, complete with white columns and a gracious porch overlooking the mountains. The Mercersburg Inn is proud to partner with the acclaimed L' Academie de Cuisine of Bethesda, MD, to present a series of culinary weekends throughout the year. Held Friday night through Sunday afternoon, the weekends feature two intensive (hands-on) cooking classes and (of course) fabulous meals. 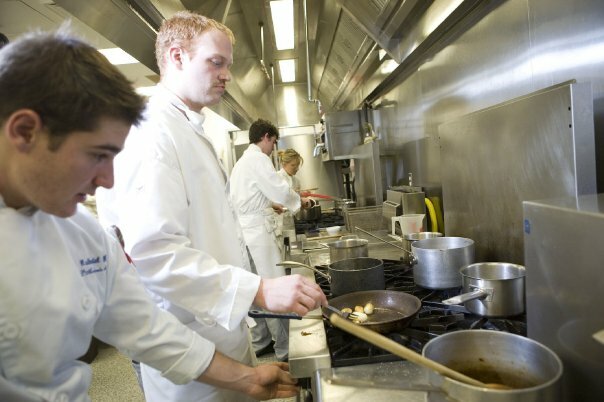 Cooking classes are held in the mornings, followed by a lunch featuring the results! Saturday night's Chef's Dinner, prepared by the Inn's Chef de Cuisine Dan Nowalk, is an elegant gala event. See our website for dates.